Completing a drywall installation project is no small process. From designing and detailing your building to metal stud framing, wallboard hanging, finishing, and more, it’s easy to see why so many builders seek out the assistance of a professional drywall company. Businesses such as AZ Drywall Finishing are valuable in their turn-key approach to drywall installation across many industries. If you are looking for drywall contractors in Chicago, our team is here and happy to assist! 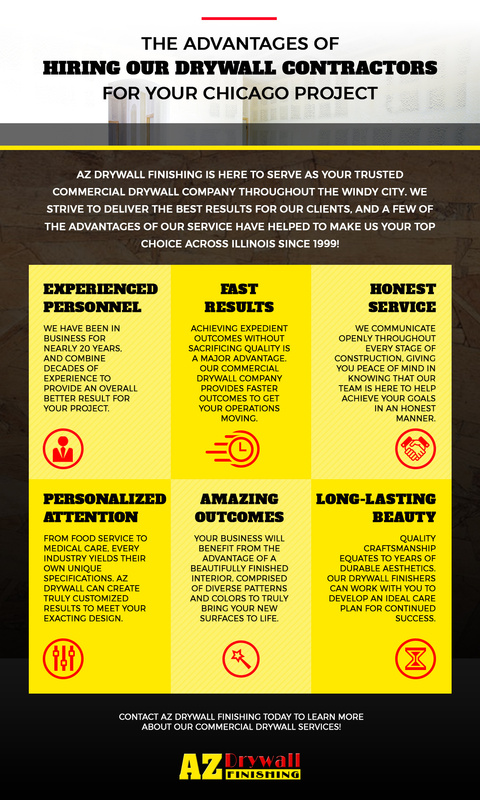 Since 1999, AZ Drywall Finishing has worked to provide premier results for builders, franchise owners, chain restaurants, and more. We’re confident that we can provide the best experience for your project. When you work with our drywall pros, you can rest easy knowing that your project will benefit from the following advantages. While our commercial drywall company is not here to change the world with radical inventions, we are working hard to set the standard for high-quality results. Drywall installation is an intensive process, and one that is much easier when you have years of experience under your belt. Our drywall contractors have been in business for two decades, combining many years of experience to ensure that your project is handled as efficiently as possible. Experience is vital, as it helps to produce outcomes that are more expedient, more beautiful, and longer lasting. Construction is a costly process, and one that relies on multiple parts working in tandem to produce a smooth, efficient result. If one piece falls out of order, it can cause serious backups, as materials, laborers, and inspectors all need to communicate effectively. Our team has worked to streamline our processes, delivering expedient results that ultimately save your project time and money. Open businesses in particular can benefit from our speedy work, as any downtime in the workplace can prove disadvantageous. While expedient outcomes are always a plus, it’s important to ensure that your drywall company is not cutting corners or delivering an otherwise dishonest result. Integrity is at the core of all of our drywall installation services. AZ Drywall Finishing was founded on the principle that honesty and clear communication are the best measures for creating lifelong business partners. We wouldn’t want to be misled, and we strive to deliver results that benefit your project and your working relationships. Beyond our fast, honest, and experienced services, our team also strives to create the best outcome that meets your design plans, goals, and budget. Our industrial drywall pros have the experience and training to provide quality outcomes across many industries, customizing our services to match your unique demands and specifications. From minor projects to large-scale overhauls, AZ Drywall is here to provide the ideal results for your project. Much of the value of your drywall company will come in the form of your walls’ finishes. It is vital for you to find a team qualified to provide beautiful results for your structure, as the building’s interior helps to establish the mood and quality of your structure. Our drywall finishers will be able to smooth your surfaces and create amazing textures, colors, and design patterns that are sure to make the most out of your new gypsum board. Be sure to invest in the right drywall installation services, as the first impressions of your interior will have a great effect on your business! The purpose of your new drywall is to encase your building in quality. Simply put, the craftsmanship of your installation services will do much to determine the long-term results. Every service – from mudding and taping to sanding and painting – must be done perfectly to ensure the best performance throughout the years. 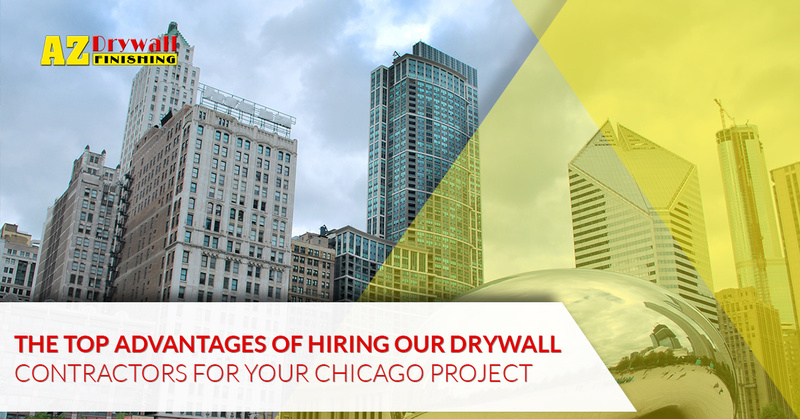 Our drywall installation team knows how to work through Chicago’s extreme weather to achieve durable, beautiful results for your project. Regardless of your business type, industry, or building size, AZ Drywall Finishing can provide amazing results on the first try. Our commercial drywall company strives to deliver ideal results to match your design plans and your vision. For decades, our drywall contractors in Chicago have delivered professional outcomes for food chains, hospitals, and more. We’re confident that our services will be ideal for your project, from new builds to renovations and beyond. Contact us today to request your free testimonial!